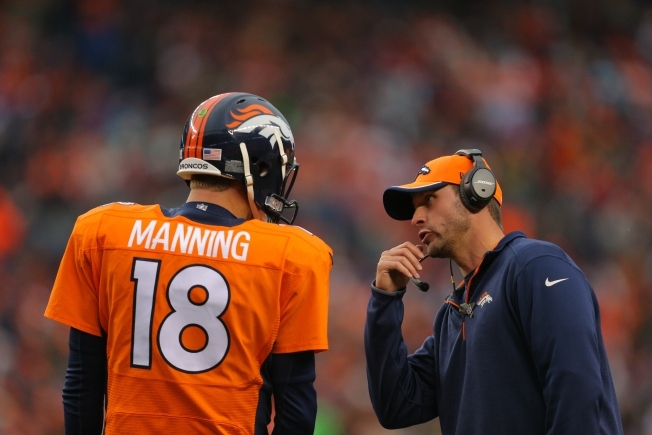 The Chicago Bears made another big move for their coaching staff Wednesday night hiring former Denver Broncos offensive coordinator Adam Gase. Gase, who originally interviewed with the Bears for their head coaching position earlier this month, came to Halas Hall on Wednesday to interview for the offensive coordinator's job. He was also considered a candidate for the head coaching job in San Francisco, as well as the offensive coordinator spots with the Baltimore Ravens and Jacksonville Jaguars. The Chicago Bears announced Gase's hiring Wednesday evening after some players tweeted hints about the news. In hiring Gase, new Head Coach John Fox elected to bring aboard his offensive coordinator from his days in Denver. Gase oversaw a Broncos offense that not only allowed Peyton Manning to spread around the ball to all of his wide receivers, but he also incorporated more running elements to the game as C.J. Anderson became an integral part of the offense as the season wore on.